ADW Launcher has long been one of the best launchers available on Google Play to change the look of your phone, and now the company behind it is back with ADW Launcher 2. This isn’t one for fans of minimalist, simple interfaces as ADW Launcher 2 is all about customization. You can change the style of the app drawer, the animation when transitioning between home screens, the number of apps shown on each page, the theme, the icons and just about everything else you might ever want to tweak. As well as making the interface look and animate exactly as you want, ADW Launcher 2 also has some clever features that add whole new functionality. 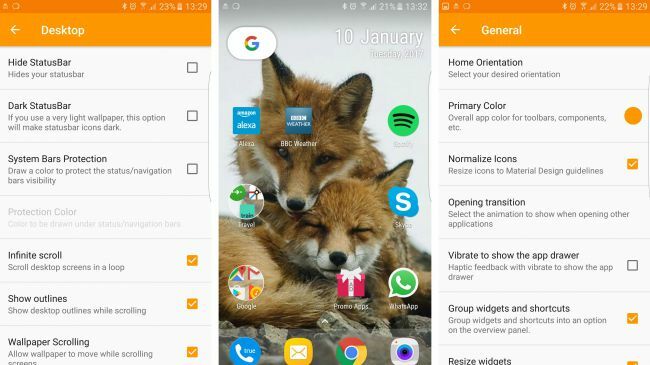 These include the ability to disguise folders as a single app – viewing the contents with a swipe, or launching the first app in the folder with a tap. There are also various customizable gesture controls letting you launch apps or functions with swipes and pinches. The bulk of the app is completely free, but there’s a single IAP to unlock a larger selection of customization options.